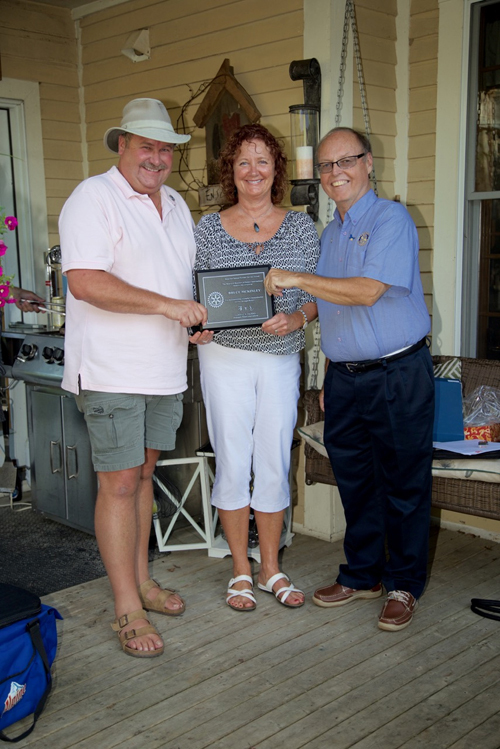 Bruce MacKinley, husband of Newcastle Rotarian Geri Mahoney, was presented with the Rotary International Rotarian Spouse/Partner Service Award at a recent club gathering. The award recognizes spouses and partners of Rotarians who have demonstrated exemplary humanitarian service through Rotary. Only a maximum of 100 individuals worldwide are selected to receive this award annually. The emphasis is on personal volunteer efforts and active involvement helping others. Bruce consistently models the attributes of “Service Above Self” as a citizen and a humanitarian within the Miramichi community. The Rotary Club of Newcastle nominated MacKinley for the award because of the countless examples of his contagious energy and service leadership. Tournament. Each year MacKinley and his mighty team of volunteer fire fighters helped to transform French Fort Cove into a winter wonderland of pond hockey competition, ice skating surfaces, fireworks and a number of other features. During the nine years of the event everyone in the region awoke from its hibernation and came alive in early February, to celebrate the season and raise funds for worthy causes identified by the community to Rotarians. A major fundraising event of this magnitude requires leadership, attention to logistic details, risk management and a dedicated team with a shared goal. Bruce provided these attributes, balanced with expertise, a powerful work ethic, a talent for rallying colleagues toward a common cause and a passion for his community. The humanitarian impact of Bruce MacKinley extends beyond Pond Hockey. For any activity or event sponsored by Rotary, you could count on Bruce and his wife Geri to provide leadership and support. They both volunteered countless hours towards the recent Rotary Spring Fest. They have also opened their home as hosts for international students. “The spouses and partners of Rotarians play an active and vital role in Rotary. They support and extend Rotary’s fellowship network and service impact in ways that cannot be counted or measured. Their involvement and commitment make Rotary a “family” in the truest sense of the word” stated Gary C. K. Huag, the outgoing President of Rotary International, in a letter acknowledging MacKinley’s receipt of the award. “With this award, our Rotary family recognizes the contributions you have made through Rotary over the years. I want to thank you for generously giving your time and effort to serve people and communities in need” Huang continued. Very much deserved recognition !!! Richard Carolyn Jardine liked this on Facebook. Kim Shaw liked this on Facebook. Michael Walsh liked this on Facebook. Brodie Donovan liked this on Facebook. Kim Hotton liked this on Facebook. Donnalu Derry liked this on Facebook. Rotary Club of Newcastle, New Brunswick, Canada liked this on Facebook. Kelly LeBlanc liked this on Facebook. Nice going Bruce Mackinley…well deserved ! ?? Christine Feige liked this on Facebook. Gary Thorne liked this on Facebook. Sandy O’Hearn liked this on Facebook. Shawn Cripps liked this on Facebook. Valerie Comeau liked this on Facebook. Kathryn Chivers liked this on Facebook. Buck Mathieson liked this on Facebook. Julie Gorring liked this on Facebook. Very much deserved Bruce! Congratulations!!! Rotary District 7810 liked this on Facebook. Laurie Ann Sutherland liked this on Facebook. Paula Septon liked this on Facebook. Audrey Shaddick liked this on Facebook. Lowell Loveday liked this on Facebook. Karon Coull liked this on Facebook. Eric Faddis liked this on Facebook. Pat Poulsen liked this on Facebook. Rafael Aguilar Medina liked this on Facebook. Siddha Param liked this on Facebook.